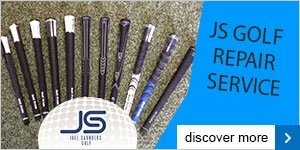 "There are dozens of different grips, hundreds of shafts and heads, lie angles to think of and thus millions of possibilities so how are you to find the right club? That daunting prospect was what took me to a custom fitting session with Joel in search of a new set of irons. A set of Mizuno MP25s had looked my way suggestively on a number of occasions, I had returned a few furtive glances and Joel had all the Mizuno fitting set up and technology to bring us together. First up was the Mizuno Swing DNA. A phone size device attached to the shaft that read things like your speed and tempo, and after three swings suggests the three best shafts from over 50 options. All three suited my swing, but there was one I couldn't live with the look of; steel dressed like graphite. After hitting more balls with the other two, the Project X shaft won out because it gave the higher ball flight I was looking for. A check for lie (1 degree upright), grip size (1 extra layer of tape) and my choice of the new Golf Pride Z grips and I was all set. There was no extra cost for shaft or grip choice and Joel beat the price of a well-known internet retailer. Oh and the MP25, well I had my head turned by a set of leggy MP5s in a short skirt and they were great to hit so I was torn. No problem for Joel. I now have a mixed set of MP5s PW to 8 and MP25s 7 to 4; the best of both worlds. Try picking that off the shelf at American Golf." I'm really pleased to have won at the weekend, I was just focusing on making my mid year goal set by Joel 'to qualify for the Kellard'. Our regular short game lessons are really helping to build my confidence in my new technique. My practice is now focused on chipping and putting rather than hitting ball after ball on the range, and with all the hours of practicing/drills, it's started to show when it counts. I got five up and downs on Sunday, without those I'd have been above handicap rather than below. My short game literally was the difference between winning and losing. I've struggled to hit Woods for the last few years and I've been using a 4 Iron off the tee for the last few months. Joel suggested a custom fitting session so I could see how I got on with the Woods he was suggesting. The fitting session was excellent and I bought a 5 Wood and a Driver as a result. That was about three weeks ago and after a couple of sessions at the range and one round of golf, I'm now hitting the ball further off the tee than ever before - not always straight, but I'm getting there! I'd highly recommend taking a fitting session and trying the Callaway X Hot Driver as it's certainly the easiest long range club I've tried to date. As a Member for six years, I have been continually frustrated at big blowout holes when playing well. I decided to commit to a course of lessons with Joel to really address the problem. After my first lesson I played in the scramble and struck the ball better and more consistently than any time I can recall at Verulam. I can see and feel the difference after two lessons.